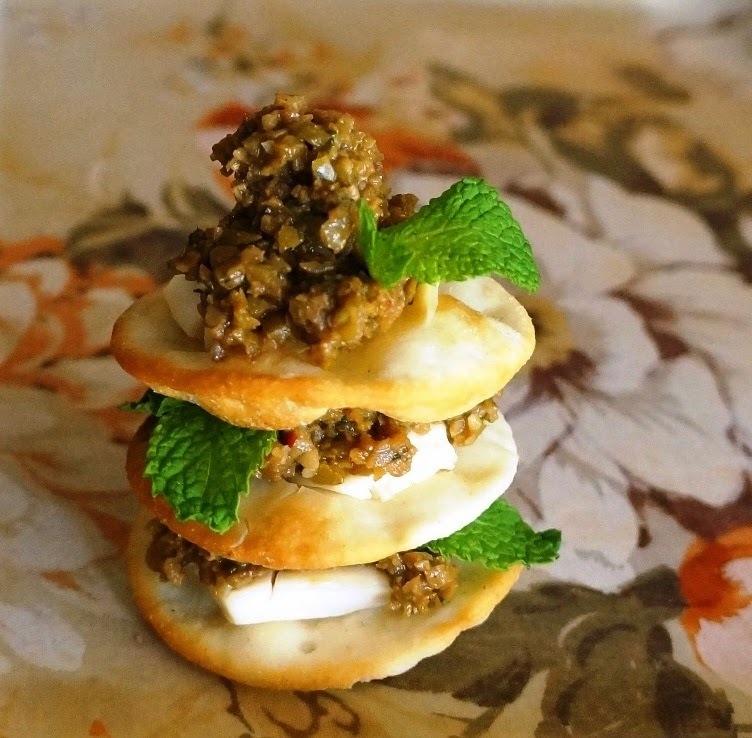 Every now and then, a big craving for Persian Olive Caviar hits me. That’s usually when something reminds me of my childhood in Iran and suddenly, my heart feels heavy. I was seven when we left and am grateful to call the States my home, but I still miss Iran. As the season marked by the bounty of harvest, Fall is a beautiful time of year there. The mountains are speckled with trees sporting reds, oranges and yellows and the breeze carries a crisp chill. That is the best time for a stop at a tea house where a warm cup of slow-brewed black tea is a comfort to a weary traveler. 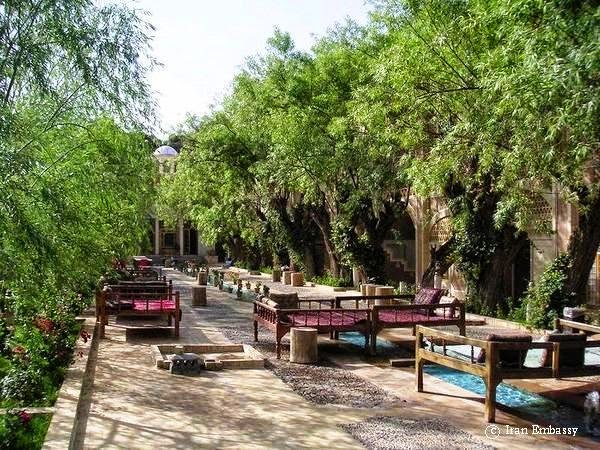 These small roadside stops are a dreamy memory for me now, with visions of pretty courtyards centered around ornamental pools and wooden beds under the shade of old trees. We are now on the cusp of Mehregan, the ancient Persian celebration of Autumn. Dating back to the pre-Islamic Zoroastrian days of Persepolis-ruled Persia, this festival was one of only two occasions when the King granted an audience. Armenians were also present.. 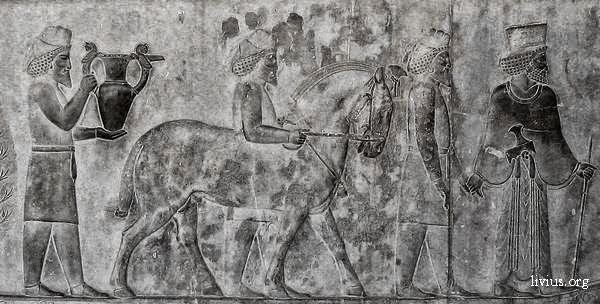 It has been noted that one year, the Armenian Governor presented the Persian King with a gift of 20,000 horses. A small landlocked country with threatening borders, Armenia has always felt a close alliance to its Persian neighbor. While my childhood days of the mighty lion with sword in hand are long gone, political and religious differences are set aside and the friendship between Persians and Armenians continues to grow strong. 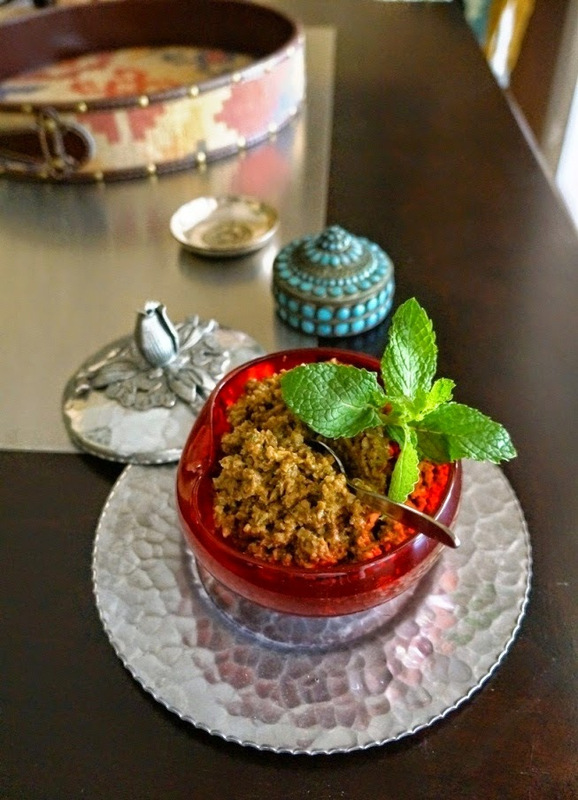 As such, I am thrilled to have been invited to participate in the First International Mehregan Cyber-Feast featuring Persian food bloggers from around the world. I will be making Persian Olive Caviar. Be warned – this is addictive stuff. Better known as Zeytoon Parvardeh which means “prepared olive,” it hails from the north-eastern tip of Iran close to where my grandmother was born. This spread is made of crave-worthy things that include green olives, walnuts, mint, pomegranate molasses, garlic. The distinct flavor comes from a spice not so well known in the West. The label usually reads “Angelica,” but it’s Persian name is “golpar,” which means “rose petal.” It is native to mountainous regions of Iran. It has a very unique taste, maybe a bit peppery with something almost floral. You really have to taste it for yourself. Persian Basket has it for a good price and ships worldwide. The seeds are ground to a powder and used for seasoning. One of the best ways to enjoy goflpar is sprinkled with salt over steamed lima beans, which brings back a wonderful memory. I remember a big family gathering at my aunt’s villa in the country town of Karaj. The long, rectangular ranch house sat in the middle of a large field with all sorts of fruit trees and vegetables. Someone came out of the kitchen with a big bowl of steamed lima beans picked earlier from the garden. Dad and I sat there together, enjoying them. 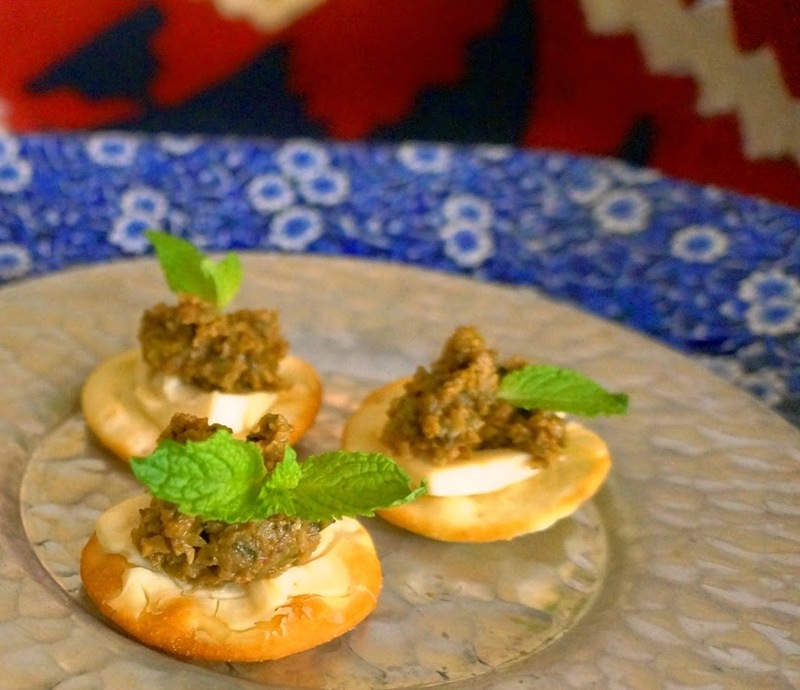 Unlike most mouth-watering Persian dishes that require time and patience to make, Olive Caviar is a snap to make. Lucky you. This rich spread is lovely on crackers with a slice of mild cheese. Roasted or grilled chicken is delightful with a heaping spoonful served with a side of vegetables. It also pairs beautifully with creamy avocados in a crisp green salad. Toss everything into the food processor and blitz to a coarse consistency. If the olives are too salty, soak them in a big bowl of cold water for 5 minutes beforehand. Thanks for teaching us about Mehregan 🙂 Sounds like such a traditional and wonderful festival! My family are totally olive fans, so we will be trying this out very soon. Loved your pictures of Iran. I do not remember much, except for those courtyards and beds. This is so good for parties! My grandma still loves making this dish, it's like a tapenade. Great use for olives too. More northern Iranian representation! I love zeitoon parvardeh and I'm obsessed with the flavor of golpar. I know what you mean about a heavy heart…I feel that way too, especially today. This looks spectacular and is full of ingredients that are so beneficial to our health. Wonderful! HI Coco, sounds like you have some wonderful memories of Iran, love olives. How wonderful is this Coco joon!!! Like Tannaz said, I love that you made something suited to a cocktail party and 'bites'. Just a question, do you think I can substitute the walnut with any other nut? I'm allergic to walnuts and I would still love to try this. Do you think almonds would work?? Coco joon, lovely and beautiful post. On my trip to Iran I tasted zaytoon parvardeh for the first time. It seems it is now served with almost most types of food. It was new to me and I love, loved it, whereas in general don't really like olives much if at all. Anyway, love your translation of it to 'olive caviar' and thank you for sharing the recipe. So beautiful, definitely want to make. Wish I could figure out botanical name for Persian Hogweed as some hogweeds here are poisonous and others aren't…. Leilee joon, I wish I could be there at your cocktail party! You must've left young, like I did. Hope you try this, Laura joon. Something tells me you throw great parties! This Mehregan celebration is so special as I got to “meet” all of you! Sure, sweetheart, why not? 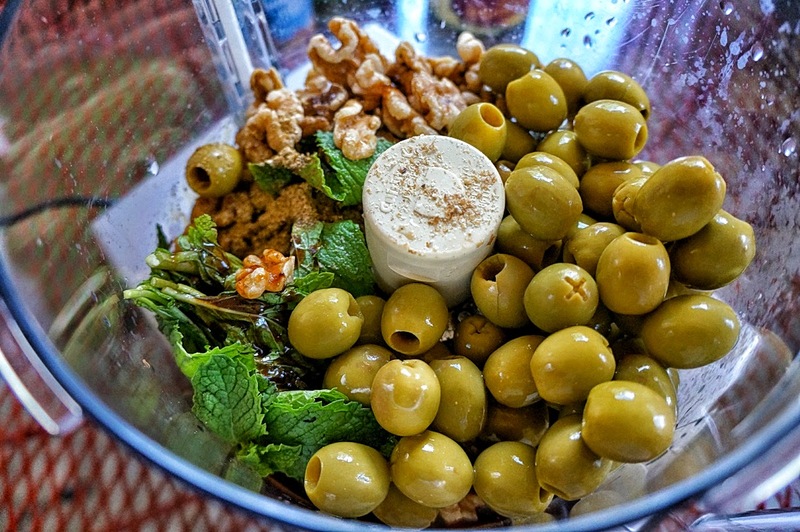 If they are olives that you enjoy eating, toss them into the mix! You totally should have a cocktail party! Thanks for reading, Cheri. Hope you try this olive caviar! Happy Mehregan, Booteh! Hope you enjoy it. Yes, absolutely almonds. Why not? You can leave the nuts out altogether, if you like, for a lighter spread. Stop by your nearby Middle Eastern grocery store and ask for “Golpar” or look in the spices for “Angelica.” You can also order it online, but it's a bit pricey. I loved reading your post!!! Wow, what great memories, it must make living in Southern Cal feel bland? Your recipe sounds awesome! Will I be able to find the golpar and pomegranate molasses? We had a tempande in Napa and Michael and I loved it!!! Have a awesome weekend!!! I loved the post! 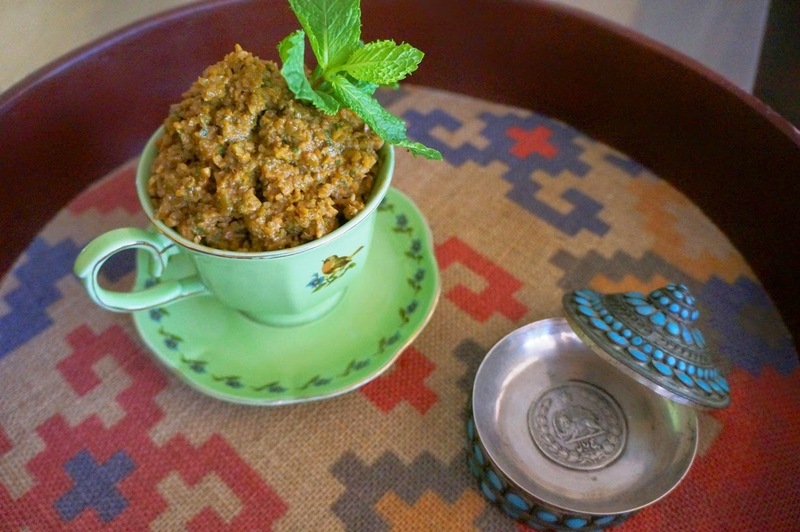 Coco jan, your zeytoon parvardeh recipe is fantastic! Golpar makes everything taste better! This is so nice! I just realized I haven't got any golpar and that I never know what was in English! the funny thing is that as a child I used to detest zeytun parvardeh and anything olive. But somehow this takes me back to childhood while I'm drooling watching the pictures! I also left Iran when I was very young and now all that is left is memories. Lots of memories and stories. I love zeytoon parvardeh. My fathers family hails from Gilan so zeytoon parvardeh was a staple at our table. Your recipe looks delicious Coco joon! Thank you for sharing it and your memories! Yeh, Saghar joon, they label it as “Angelica,” but that's not technically accurate. Thank you! We loved it. Looked for the receipe because we know it from our persian restaurant in Germany – and it was exactly what we wanted – but better. I’m so happy to hear that Cori!